A headstone stolen from a graveyard. The Stolen Headstone is a Halloween item. It appears only during the ARK: Fear Evolved event. Stolen Headstones can be used to summon a Witch Hat Skin at the Obelisks. They can also be used for simple decoration. 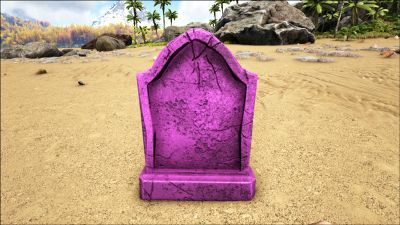 Like the craftable Basic Gravestone, these headstones can be dyed and can have text set, but players cannot paint on them like they can on the craftable gravestones. Also, when being picked up from the graveyards, the Stolen Headstones will make a "whoo" sound from a ghost. Demolishing the Stolen Headstone you get 6 Chitin or Keratin and 17 Stone, which is a nice way of farming Chitin or Keratin early on. This page was last edited on 17 November 2018, at 06:06.